The museum now has the largest collection of original Boer War medals on display in Australia. Director and researcher Allan Woodward has compiled the stories for the 86 men represented. 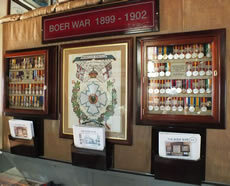 This display contains many of the Boer War medals, as well as folders of information on all Boer War soldiers represented at the museum. 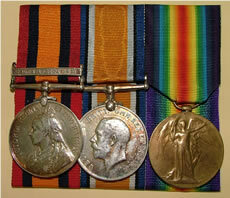 Do we have Boer War medals and information relating to your family member? Andrew Bruce Robert Allan, born in May 1886, claimed to be the youngest Australian to serve in the South African War, stowed away at 13½ to enlist and serve, under the name of Bruce Allan, being invalided home due to enteric fever. He later served in World War 1 from October 1917 to August 1918 and he was killed in action. 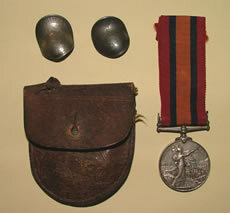 1365 Bugler B. Allen of the Victorian Mounted Rifles – Medals: Queen's South Africa Medal (1901), British War Medal, Victory Medal. 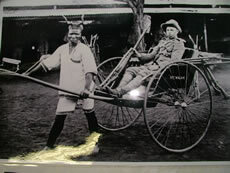 This photograph depicts Arthur Grevell sitting in a rickshaw somewhere in South Africa during the Boer War. Grevell, a farmer from Wondai, near Kingaroy, went on to serve in World War 1 as 556 Private Grevell of the 12th Machine Gun Company AIF. John Orr came to Australia at the age of 5 years old and left for service in the Boer War at the age of 20. During conflict at Jamestown, South Africa, Corporal Orr was shot by a bullet that hit his money pouch containing two South African coins. The bullet tore a hole in the pouch and bent the two coins and threw John from his horse. Orr managed to remount his horse and attempted to gallop away when he was hit in the back by an explosive bullet which killed him instantly. This tin contain chocolate that was a gift from Queen Victoria in 1900 to all Boer War soldiers serving at that time. There were three different suppliers of chocolate, and three tin designs. One tin on display still contains the original unused chocolate.